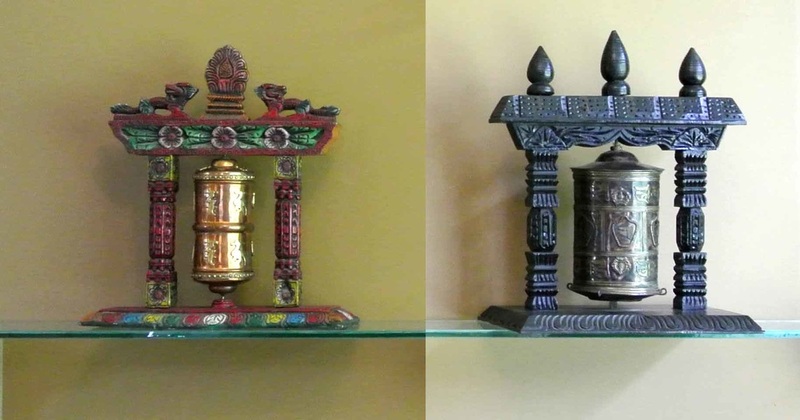 A prayer wheel is a cylindrical wheel on a spindle made from metal, wood, stone, leather or coarse cotton. Traditionally, the mantra Om Mani Padme Hum written in Sanskrit on the outside of the wheel. Also depicted are Protectors and very often the 8 auspicious symbols, Ashta-mangala. At the core of the cylinder is a Life Tree often made of wood or metal with certain mantras written on or wrapped around it. Many thousands (or in the case of larger prayer wheels, millions) of mantras are then wrapped around this Life Tree. The Mantra Om Mani Padme Hum is most commonly used, but other mantras may be used as well. According to the Tibetan Buddhist tradition based on the lineage texts regarding prayer wheels, spinning such a wheel will have much the same meritorious effect as orally reciting the prayers.